1. Following the first two pilot projects on collaborative search and examination (CS&E) under the PCT, which were conducted by the European Patent Office (EPO), the Korean Intellectual Property Office (KIPO) and the United States Patent and Trademark Office (USPTO) in 2010 and 2011-2012 respectively, the EPO, the Japan Patent Office (JPO), KIPO, the State Intellectual Property Office of the People's Republic of China (SIPO) and the USPTO (the IP5 offices) are set to operationally launch a third CS&E pilot project. The aim of this pilot project will be to further develop and test the CS&E concept amongst the IP5 offices and, in particular, to assess user interest in CS&E products and the expected efficiency gains for the offices. 2. The concept of CS&E under the PCT refers to the collaboration of examiners from different international authorities in different regions and with different working languages on one international application for the establishment of an international search report and written opinion under PCT Chapter I, which, although remaining the opinion of the chosen International Searching Authority, is based on contributions from the participating offices. 3. 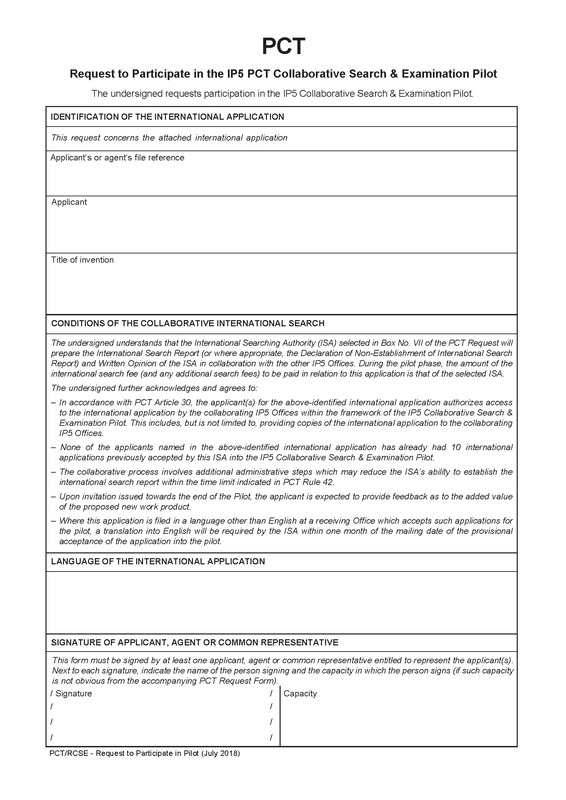 In the pilot project, the examiner from the IP5 office acting as competent International Searching Authority under Rule 35 PCT for a given international application ("the main examiner") will conduct the search and examination as for any other international application and establish a provisional international search report and written opinion. These provisional work products will then be transmitted to peer examiners from the other participating IP5 offices in their capacity as International Searching Authorities. Peer examiners will provide the main examiner with their contributions, taking into consideration the provisional international search report and written opinion. The final international search report and written opinion will be established by the main examiner after consideration of the contributions from the peer examiners. Further details regarding the implementation of the CS&E concept within the framework of this pilot project are provided below. 4. Under the pilot project, with a view to assessing the users' interest in a CS&E product, international applications processed under the collaborative scheme will be selected by applicants ("applicant-driven approach"), whereas under the two previous pilot projects the applications were selected by the offices. 5. Applicants wishing to participate in the pilot project must submit a request for participation in the pilot by using a standard participation form and file it together with the international application with the receiving Office of one of the IP5 offices or the International Bureau of the World Intellectual Property Organization (WIPO). The participation form is available in all official languages of the IP5 offices on the WIPO website at www.wipo.int/pct/en/filing/cse.html. A copy of this form is annexed to the present notice. 6. For international applications filed in English, requests for participation in the pilot may be filed as from 1 July 2018. Each applicant will only be able to select a limited number of international applications. 7. Until 31 December 2018, only international applications filed in English will be accepted into the pilot. Thereafter, the competent International Searching Authority under Rule 35 PCT (also referred to as "the main International Searching Authority") may also accept international applications filed in a language other than English. Where a main International Searching Authority decides to accept international applications filed in a language other than English it will inform applicants accordingly by way of a communication published on its website. Such communication will specify the additional languages which will be accepted for the purposes of the pilot and the date as of which requests for participation in the pilot may be filed in such languages, and provide explanations regarding their acceptance and processing. 8. The receiving Office will transmit the participation form to the International Bureau and the main International Searching Authority as part of the record copy and search copy respectively. Upon receipt of the search copy, the main International Searching Authority will assess whether the requirements set out in part III below are met and will notify the applicant and the International Bureau whether or not it accepts the request for participation in the pilot. It will do so using Form PCT/ISA/224 (Communication in Cases for Which No Other Form Is Applicable). 9. The main International Searching Authority will perform the search and examination in the same way as for international applications not processed under this pilot. It will establish a provisional international search report (Form PCT/ISA/210) (or, where appropriate, declaration of non-establishment of international search report (Form PCT/ISA/203)) and written opinion (Form PCT/ISA/237), and, where applicable, a record of the search strategy. The form and content of the record of search strategy will be based on the practice of the International Searching Authority concerned. 10. The main International Searching Authority will transmit these provisional work products to the peer International Searching Authorities, where peer examiners will prepare a contribution to the final search product, taking into consideration the provisional work products prepared by the main International Searching Authority. They will also perform additional searching to the extent deemed necessary. 11. With respect to the handling of non-unity cases by the peer International Searching Authorities, the principle of the first invention will be followed. This means that, whilst each main International Searching Authority will follow its own standard non-unity procedure, the provisional work products submitted to the peer International Searching Authorities are based only on the invention first mentioned in the claims. Peer examiners will focus their searches on what they determine to be the first invention, regardless of whether, according to their view, the provisional work products are directed to one or more inventions. 12. Each peer International Searching Authority will transmit its contribution to the main International Searching Authority using the standard peer contribution form. Depending on its practice, it will either record its contribution on the form itself or use the form as a cover sheet for standard forms PCT/ISA/210 and PCT/ISA/237. Peer contribution forms and any peer contributions attached to them will be made available as separate documents in PatentScope. 13. The main International Searching Authority will consider the contributions received from the peer International Searching Authorities and prepare the final international search report (Form PCT/ISA/210) (or, where appropriate, declaration of non-establishment of international search report (Form PCT/ISA/203)) and written opinion (Form PCT/ISA/237) in the light of these contributions. It will strive to establish these final work products within the time limit under Rule 42.1 PCT. However, compliance with this time limit cannot be guaranteed due to the collaborative nature of the pilot project which inherently results in additional administrative burdens. The final work products will be transmitted to the applicant and the International Bureau. 14. Final CS&E work products will be identified either by an indication in box V of Form PCT/ISA/237, or at the top of a supplemental sheet referenced in said box, as the result of collaboration under the pilot which does not necessarily reflect the opinions of all IP5 offices. Only final CS&E work products may serve as a basis for requesting participation in a Patent Prosecution Highway (PPH) pilot programme. 15. The offices will exchange documents and information with each other via an ePCT-based platform ensuring a secure and confidential data transmission. This platform will be provided and maintained by the International Bureau. 16. In this pilot project, the level of the international search fee charged by each IP5 office remains unchanged. Applicants participating in the pilot will therefore only pay the standard fee for a PCT Chapter I search at the competent International Searching Authority. However, if following this pilot the CS&E product is implemented as a regular product under the PCT, applicants will have to pay a specific CS&E fee. The maximum prospective amount of the CS&E fee is the aggregate amount of the search fees of the participating International Searching Authorities plus an administrative fee to cover the costs of collaboration. 17. Towards the end of the pilot project, applicants who have participated in it will be asked to complete a questionnaire about their interest in a regular CS&E product under the PCT. Their replies will be taken into account by the IP5 offices in their assessment of the pilot project. 18. The requirements for applicants' participation in the pilot project are of two kinds: requirements to be met by applicants and limitations set by offices. (a) The request for participation in the pilot must be submitted using the standard participation form and filed together with the international application. (b) The participation form and the international application must be filed with the receiving Office of one of the IP5 offices or with the International Bureau as receiving Office. (c) Where the participation form and the international application are filed with the EPO, they must be filed in electronic form using one of the following filing tools: the EPO Online Filing software (PCT update 1 April 2018 (build 3.51.257)), PCT-SAFE client version 3.51.081.257 (1 April 2018) or ePCT. (d) Until languages other than English are accepted into the pilot as provided for under paragraph 7, the participation form and the international application must be filed in English. (a) The applicant must not already have had ten international applications accepted in the pilot by the same main International Searching Authority, ten being the maximum number of applications permitted into the pilot per applicant at a same main International Searching Authority. (b) Each main International Searching Authority aims to accept 100 international applications into the pilot, spread over the course of two years. The main International Searching Authority will accept applications based on achieving this aim. (c) The main International Searching Authority must not already have accepted into the pilot the maximum number of applications that it considers appropriate in the technical field of the application for which the participation is requested. This requirement aims at ensuring the diversity of the technical fields of the applications processed under this pilot. (d) The main International Searching Authority must not have considered that there is a specific reason (e.g. defect in the application, no sequence listing in text format complying with WIPO Standard ST.25 is available) impeding the processing of the application according to the timeline for the collaborative process. 21. The pilot project is divided in two phases, a preparatory phase and an operational phase. The preparatory phase, which started on 2 June 2016, was dedicated to the administrative and practical preparations required to ensure a smooth functioning of the pilot. The operational phase will start on 1 July 2018 and will run until 1 June 2021. It will be dedicated to the processing of applications under the collaborative scheme, monitoring them for evaluation purposes and assessing the outcome of the pilot. It will also cover the assessment of the effect of the collaboration in the subsequent national/regional phases.